You are ordering a desk appraisal, this is a report that takes into account the information you've provided to us and not a physical inspection done by us. ■ If you want to mail us your order, please print out the application below. 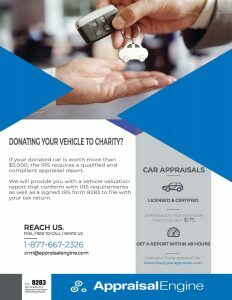 Charity Car Appraiser is a website operated by Appraisal Engine Inc and is designed to help donors order a vehicle valuation report for tax filings.